hch participated in this collaboration with IMO to design an innovative façade concept for a 100-meter high residential tower overlooking the Danshui River. With its location at the Taipei Bridge, Taipei's first and still one of its most important cross-river thoroughfares, it was important to present the building as a sculptural element that would uplift the riverside cityscape. Residential towers in Taiwan often have enormous energy costs due to massive use of air conditioning throughout the year. By starting from a study of temperature, relative humidity, wind speed, global horizontal illumination, sky coverage, etc., the façade design is calculated to reduce air conditioning usage throughout the year by 34%. 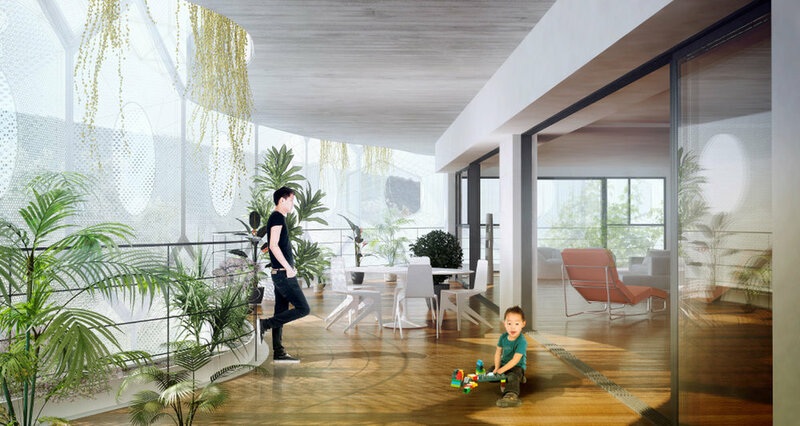 In addition to providing this energy and cost saving and raising the sustainability profile of the building, the design optimizes the comfort level of its interior spaces, further enhancing the lives of its residents.